You’ve created a dynamite Facebook page, you’ve got the 25 “likes” to get a unique username and you’ve posted lots of good content! 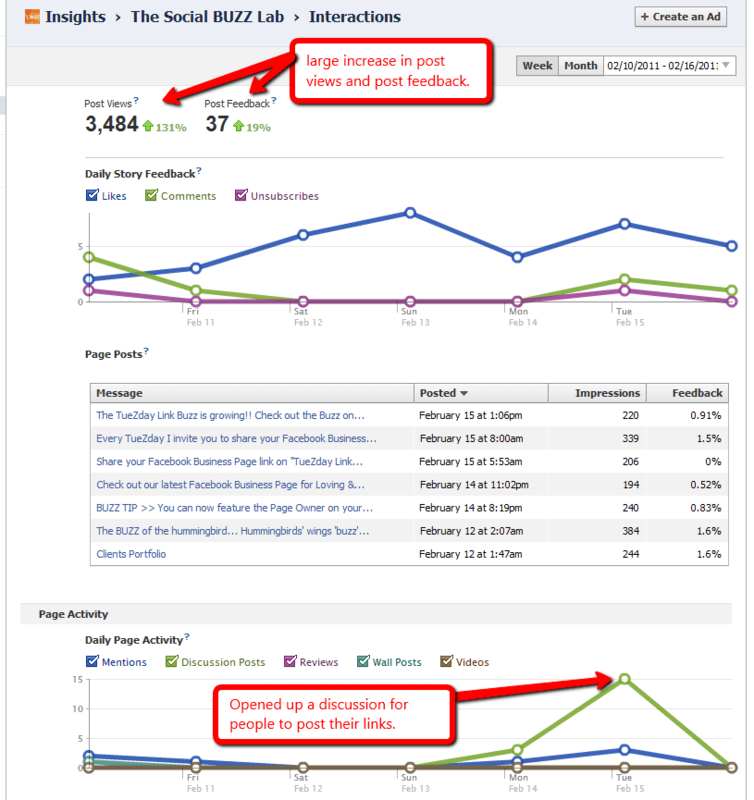 Take a look at your insights and see if your page is generating any Buzz! Last week I opened a discussion tab on the Social Buzz Lab page and invited people to post links to their pages on it. I called it TueZday Link Buzz! You can see the spike in the page activity from the image. Post views and post feedback had a huge increase also. Thanks goes out to Denise Wakeman for suggesting this in her post Six Ways to Engage Your Facebook Fans. Tuezday Link Buzz will be a regular feature on our wall every Tuesday! Post your Facebook page link here. We’re going to try some different things to see what works best so we hope you will leave us your comments!! The goal here is to create a little BUZZ and get traffic to your page!! Here are 4 tips to generate Social BUZZ for your Facebook page. Create an event for your page using Denise Wakeman’s suggestions. Be sure to market your event! Use Twitter and LinkedIn to bring traffic to your Facebook page. Select “Use Facebook as YOUR PAGE NAME” and post comments on other page walls. While you’re there give them a thumbs up with a “LIKE”!! Your page can now like other pages! So you get two for one!! While you are still using Facebook as Your Page Name, add status updates to your page wall and tag other Facebook pages you have liked using the ‘@’ sign followed by the name of the page (no spaces) and select the correct page from the drop down menu. Join a Facebook link sharing group. There are groups on Facebook and LinkedIn. I belong to the Social Media Marketing LinkedIn Group. 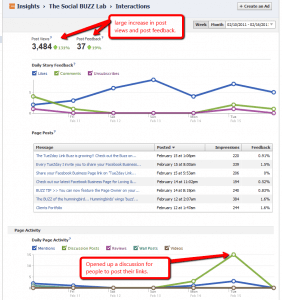 Do you have other tips you use to generate social buzz for your pages? Share them in the comments below!! Thanks for cobuginttinr. It’s helped me understand the issues.